Over the last year or so, I’ve used my Tangerine MasterCard as my main method of purchase. I put every purchase on my credit card, pay it off completely every month, and reap the rewards that the credit card offers me. But due to Tangerine changes, it was time to make a switch to a new card. 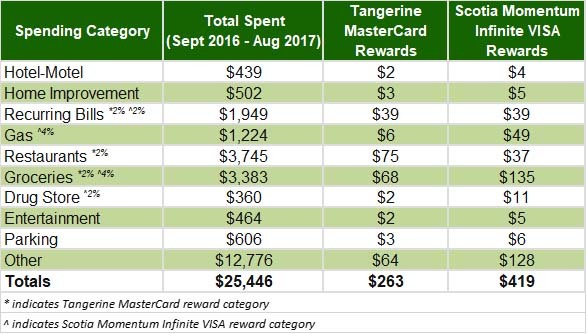 Let’s look at the data and compare Tangerine MasterCard to Scotia Momentum VISA Infinite. These were great rewards for a no fee credit card. Over the last 12 months I made over $300 in rebates! All for just putting all purchases on my credit card. Tangerine made what seemed to be a minor switch a few months ago, but had a major impact on my bottom line. Tangerine lowered their rebates on the ‘all other purchases’ category from 1% to 0.5%. This may not seem like much, but a lot of purchases full under this category. Another difference for this card is that it has a $99 annual fee, which is waived during the first year. Both of these cards have pretty good rewards, and between the no fee Tangerine MasterCard and the $99 annual fee for the Scotia Momentum VISA Infinite card, it’s hard to tell which one would be best for me. Luckily, I have cold hard data from the past year of using my Tangerine MasterCard. Using my last year of spending habits, I can predict how much I will receive in rewards in the upcoming year. As you can see above, I will make quite a bit more using the Scotia Momentum VISA Infinite, in my first year. $156 more! And in my second year, when the $99 annual fee kicks in for my Scotia Momentum VISA Infinite, I’ll still make an additional $57 in rewards! After looking at these numbers, I decided to make the switch! I applied and received my new Scotia Momentum VISA Infinite. If I really wanted to maximize my rewards, I would keep using my no fee Tangerine MasterCard for all Restaurant, Parking, and Home Improvement purchases – but I prefer to keep it simple and use the one card for everything.